Pilates » What is Pilates? 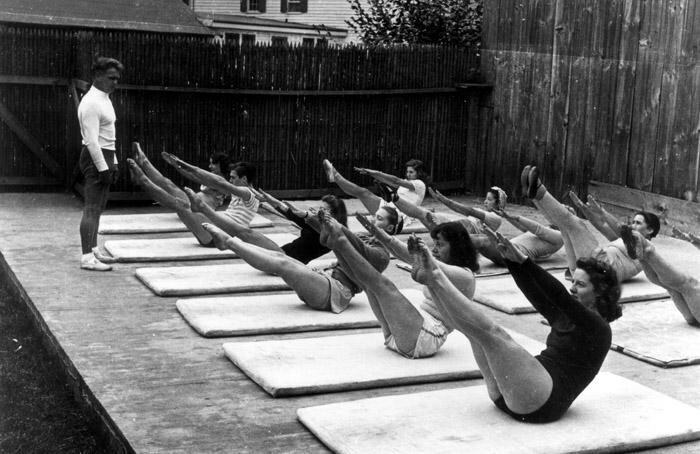 Pilates is a form of exercise that was developed by a man called Joseph Pilates in the 1940’s. It involves a series of exercises/movements geared to work and condition the whole body. It will improve your flexibility, strength and give you ease of movement. People often think of it as a “core workout” but Pilates is so much more than this! It has become popular recently with celebrities and athletes being widely regarded as a total body workout. To get involved in Pilates you can either join a class or alternatively have individual sessions in the studio. Classes are mat based and an instructor will guide you through a series of exercises and will help you with your technique to keep the exercise safe and effective. Small apparatus such as foam rollers and spiky balls are also regularly used in classes. Studio sessions involve various Pilates machines – including the Reformer, Ladder Barrel, Cadillac and Chair. Unusual names but fantastic equipment that challenge, are great fun & add something extra to your workout! With Pilates if practiced regularly you will see and feel the difference in your posture and will notice that you can move more freely – you may well be able to touch your toes even if you have not been able to do this for a number of years! Pilates is really for everyone. Due to its beneficial affects with regard to flexibility, strength and control, it can be enjoyed by young and old, male and female, athletes and people who just want to stay active and healthy. Small numbers. We have a maximum of 12 people in each class. Classes should be tailored for different levels of experience and ability. At PhysioworksNI we have Beginner classes, Progressive Beginner classes, Intermediate and Intermediate+. This is extremely important especially if you are learning the technique for the first time. You will learn the method much more quickly and you will also enjoy it more. Fully Qualified Instructors. The best teachers will be those who have completed a certified training course over many months and have practised Pilates for a number of years themselves. All our instructors at PhysioWorksNI are fully qualified Instructors with a wealth of experience. Pilates and Physiotherapy are a great combination. PhysioWorksNI is a custom built Physiotherapy practice and Pilates Studio. Many clients after Physiotherapy attend classes or 1-2-1 sessions to help prevent further problems or reoccurance of an injury. We also have the advantage of having physiotherapists on site and as Instructors to give advice when required. Pilates is an excellent therapy for the treatment of back pain. Many of our clients over the years have let me know how they have found Pilates has helped to reduce their back pain and allow them to move with more ease. It has helped them carry out normal day to day tasks like cutting the grass or getting the shopping out of the boot without pain! A lot of our back pain has been caused by sedentary lifestyle so our backs have become weak and vulnerable. Our spines are held in the same position or do the same repetitive movements over and over again. Pilates, carried out regularly will allow the spine to move more freely and with less pain. It will also make you more aware of how you sit and stand. Pilates and sport compliment each other very well. Whether you are competing at club level, international level or just enjoy taking part in sport and fitness activities for general health, making Pilates part of your fitness routine will be of benefit to you. It can help to improve athletic performance and help towards preventing injuries.